Planck Aerosystems builds unmanned aerial systems (UAS) for maritime professionals. Based in San Diego, Planck was founded on the idea that putting an aircraft on every boat would represent a transformational change to maritime industry through improved data acquisition, situational awareness and safety. 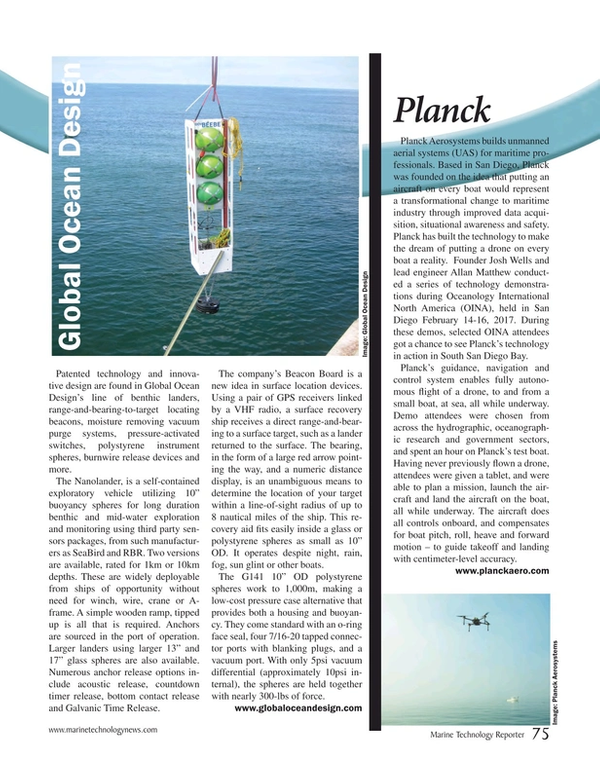 Planck has built the technology to make the dream of putting a drone on every boat a reality. Founder Josh Wells and lead engineer Allan Matthew conducted a series of technology demonstrations during Oceanology International North America (OINA), held in San Diego February 14-16, 2017. During these demos, selected OINA attendees got a chance to see Planck’s technology in action in South San Diego Bay. Planck’s guidance, navigation and control system enables fully autonomous flight of a drone, to and from a small boat, at sea, all while underway. Demo attendees were chosen from across the hydrographic, oceanographic research and government sectors, and spent an hour on Planck’s test boat. Having never previously flown a drone, attendees were given a tablet, and were able to plan a mission, launch the aircraft and land the aircraft on the boat, all while underway. The aircraft does all controls onboard, and compensates for boat pitch, roll, heave and forward motion – to guide takeoff and landing with centimeter-level accuracy.